The only reason Egypt has even existed from ancient times until today is because of the Nile River, which provides a thin, richly fertile stretch of green through the desert. For the first time, the country fears a potential threat to that lifeline, and it seems to have no idea what to do about it. Dam construction on international rivers often causes disputes over the downstream impact. But the Nile is different: few nations rely so completely on a single river as much as Egypt does. The Nile provides over 90 percent of Egypt’s water supply. Almost the entire population lives cramped in the sliver of the Nile Valley. Around 60 percent of Egypt’s Nile water originates in Ethiopia from the Blue Nile, one of two main tributaries. That is despite the fact that Egypt already receives the lion’s share of Nile waters: more than 55 billion of the around 88 billion cubic meters of water that flow down the river each year. It is promised that amount under agreements from 1929 and 1959 that other Nile nations say are unfair and ignore the needs of their own large populations. Complicating the issue, no one has a clear idea what impact Ethiopia’s dam will actually have. Addis Ababa says it will not cause significant harm to Egypt or Sudan downstream. Internal government studies estimate that for every reduction of 1 billion cubic meters of water in Egypt’s supply, 200,000 acres of farmland will be lost and livelihoods of 1 million people would be affected, given that an average of five people live off each acre, a senior Irrigation Ministry official said. He spoke on condition of anonymity because he was not authorized to discuss the figures. They say Egypt could suffer no damage at all if it and Ethiopia work together and exchange information during the filling of the reservoir, adjusting the rate to ensure that Egypt’s own massive reservoir on the Nile, Lake Nasser, stays full enough to meet Egypt’s needs during the years of the fill. Unfortunately, that isn’t happening between the two countries, whose ties have often been deeply strained. 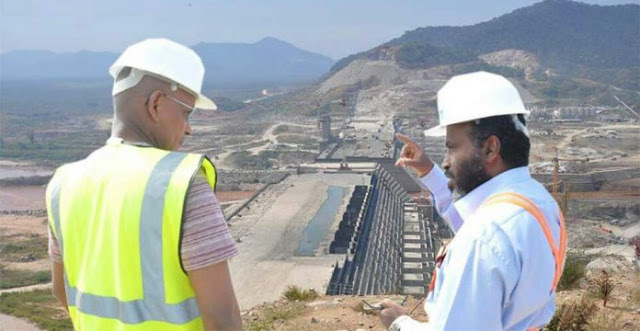 “We have taken into account (the dam’s) probable effects on countries like Egypt and Sudan,” Ethiopia’s water, irrigation and electricity minister, Sileshi Bekele, told reporters in Addis Ababa. He added that plans for the filling process could be adjusted but did not elaborate. In June, Egyptian Foreign Minister Sameh Shukri spoke of “difficult talks” and complained of delays in the impact study. He warned that unless Ethiopia addresses Egyptian concerns, Egypt will search for an alternative path, though he did not elaborate. The irrigation official said that Egypt is trying to build international pressure on Ethiopia. A high-ranking government official acknowledged there’s little Egypt can do. “We can’t stop it and in all cases, it will be harmful to Egypt,” he said. A senior diplomat involved in the negotiations only shrugged. “We can only wait and see,” he muttered. Both spoke on condition of anonymity because the talks are still ongoing. International law also provides little recourse. International charters spell out broad principles on managing rivers, saying waters should be shared in an equitable way and one country’s projects on a river must not cause “significant harm” to another. For Ethiopia, the $5 billion dam is the realization of a long-delayed dream. Ethiopia’s infrastructure is among the least developed in the world, leaving the vast majority of its 95 million people without access to electricity. The dam’s hydroelectric plant is to have a capacity to generate over 6,400 Megawatts, a massive boost to the country’s current production of 4,000 Megawatts. “If everybody is working together, if there is trust, it is possible to have win-win,” said Kenneth M. Strzepek, professor of water resources engineering and economics at the University of Colorado at Boulder. He believes that even in the worst case scenario, damage to Egypt’s economy will not be huge. “But you will hurt people,” he said. “If you reduce the flow, you hurt the farmers.” Over 80 percent of Egypt’s water goes to agriculture. “Ethiopia wants full control over the Nile. It doesn’t want to abide by any deals,” said Hani Raslan, a Cairo-based expert in African affairs. In 1999, the countries established the Nile Basin Initiative as a forum on the river’s use. Egypt and Sudan walked out of the talks, demanding their “historic rights” be recognized. The boycott backfired. The other nations went ahead, creating their own Cooperative Framework Agreement in 2010 and throwing support behind Ethiopia’s dam. Sudan and Egypt remained hold-outs. Salman Salman, a Sudanese water expert, said Egypt ignored past opportunities to work together with Ethiopia. “There is this arrogance (in Egypt) and the feeling that this is our river and no one can touch it,” he said.